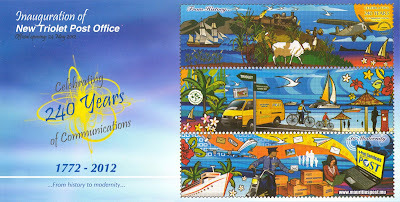 To mark the opening of the new Triolet Post Office on May 24, 2012, The Mauritius Post put on sale a Special Commemorative Cover. With a view to providing a better environment to both its local and foreign customers, the Mauritius Post is sparing no efforts to invest on the modernisation and renovation of its infrastructure. After the opening of new Post Offices in Glen Park, Pailles, Ebène, Trou aux Biches and La Flora, the MPL inaugurated a modern building in the northern village of Triolet. Prior to the construction of a composite building accommodating both a Post Office and the Telephone Exchange in 1967, Postal Services in Triolet were delivered through a Postal Agency. The old building was inaugurated on 7 September 1967. A large range of postal services with a banking service through the Post Office Savings Bank were provided. 45 years later, a new, modern and spacious Post Office has been erected, providing over 65 postal and non-postal services, such as Public Internet Access Point, e-telegram, e-money transfer, e-commerce and so on, to the inhabitants of Triolet and its vicinity and to tourists as well. 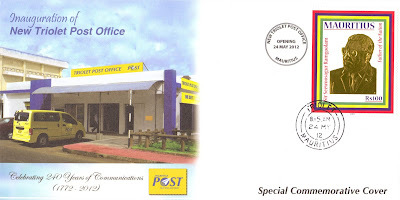 The inauguration of this new Post Office matches well with the motto of the celebrations of the 240 years of postal services in Mauritius: "from history to modernity".